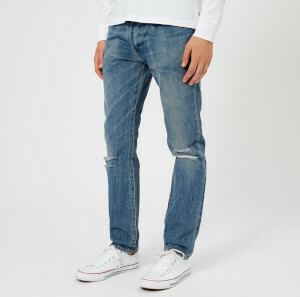 A redesign of Levi’s iconic 501® jeans with a slimmer leg, the blue skinny jeans retain all the features of the original classic jean. The 501® skinny fit jeans have a subtle faded finish are created with a slim fit through the seat and thigh, and a signature button fly. Woven with warp stretch denim that stretches the jeans vertically instead of horizontally, to mimic the wearer’s movement, the shape and the characteristic ‘rigid’ look of the 501® is maintained.